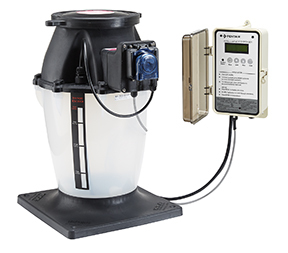 IntellipH Controller is a safe and convenient way to regulate a swimming pool's ph level. It automatically dispenses muriatic acid into the pool to eliminate fluctations in the pH level. IntellpH is the perfect companion for the IntelliChlor salt chlorine generator and together they help sanitize and balance pool water to keep it sparkling clear. 521377 IntellipH Canister with Controller 18 22" x 14" x 18"